By Demoney, Jerry; Meyer, Susan E.
New York, NY: Watson-Guptill Publications, 1982. Text/New. Black linen boards w/silve spine lettering/Fine. Illustrated DJ/NF; under mylar. 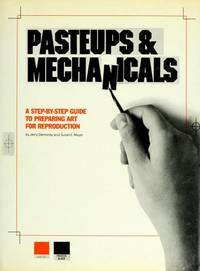 Guide to studio reproduction of art work. Text augmented by photographs of co-author Jerry Demoney. The ten chapters are: Chapter 1, From Concept to Print; 2, Materials & Tools; 3, Basic Inking Techniques; 4, Art & Reproduction Line Art; 5, Working With the Art; 6, Working With Type; 7, Basic Pasteup Procedures; 8, More Complex Mechanicals; 9, Errors, Corrections, & Changes; and, 10, Tricks of the Trade. Fine reference/resource.. First Edition, 4th Printing. Hard Cover. Near Fine/Near Fine. Illus. by Jerry Demoney (Photographer).